Author and Victoria McIver both fifth-year students. As a University student, a good deal of my holiday time is spent doing prac work at various clinics around New South Wales. Last summer however I was lucky enough to go somewhere wildly different. Along with one of my uni friends I was able to spend two weeks at the Hong Kong Jockey Club. It would prove to be an experience radically different from other prac work I’ve done, both in the setting and the way in which veterinary medicine was practised. On our first day at the Hong Kong Jockey club we were given a taste of what daily life is like for the vets working there. Located at Sha Tin in the north of Hong Kong’s mainland, the complex consists of a clinic and then twenty four stables each allocated to a different trainer. Like the rest of Hong Kong, space here is at a premium. Each stable complex holds approximately sixty horses and is three storeys high. Such a massive area can be a little disorienting for new students but after two weeks we began to pick up the lay of the land. Every morning we would be allocated a vet and led around the club to see their morning activities. Each vet has around five or six trainers who they see regularly throughout the week and handle their caseload as well as performing routine duties. We moved through the stables observing endoscopies, injections and dental treatments. Each stable has a large number of stable hands (‘mafoo’ for the locals) who have each horse caught and ready for the vet upon their arrival, making a task like giving thirty injections take no time at all. We also saw a variety of supplementary treatments that would vary from trainer to trainer. Some used dufalyte infusion; others would infuse their own formulations of dextrose, potassium and other electrolytes. Other trainers would take regular blood samples of in work horses, using a number of analytes as performance indicators. We would also regularly see horses trotted up for both routine and diagnostic lameness exams. Treatment costs in Hong Kong were not a concern for many of the trainers and so in most instances vets were given free reign to follow up and treat cases in any manner they wished. This in conjunction with an excellent records network, which could be accessed by the vets from any computer within the complex, meant that almost all the horses at the club had detailed histories available. For most of the afternoon we stayed in the clinic. Here horses are brought in for diagnostics like radiography, ultrasonography and scintigraphy as well as therapeutics such as joint injections, endoscopic procedures and lameness investigations. Shockwave therapy is commonly used by the clinic to treat various tendon and soft tissue injuries, as well as tool for managing back pain. At one point during our time we witnessed acupuncture being performed on a horse as a treatment for back pain, something not generally practiced by vets in rural NSW. Tuesday and Wednesday were fairly similar. Each morning we would follow vets performing routine duties and following up cases in the stables. In the afternoon we would accompany them as they performed specific treatments in stables or the clinic. Most of the conditions seen at the jockey club were soft tissue injuries to tendons or suspensory ligaments. This was not a surprise given the intensive racing that occurs here. During my time at the club I saw numerous injuries to superficial and deep digital flexor tendons, as well as suspensory ligament injuries. These were treated in a number of different ways utilising techniques not commonly seen in Australia. As I previously mentioned shockwave therapy was commonly used for these types of injuries. The theory behind this is that in a manner similar to ultrasound, high energy waves are emitted that release energy when they strike a dense structure such as ligament or bone. This energy is then theorised to stimulate fibroblasts and promote the development of connective tissue. I also observed the use of platelet rich protein (PRP) in the treatment of tendon injuries. PRP is an autologous solution that concentrates plasma with the aim of giving it a platelet concentration that is approximately 8 times higher than that of normal plasma. Injections of this were guided using ultrasound and placed directly into the site of the injury. This injection was often combined with stimulating agents such as calcium or thrombin to further promote healing. Another technique seen was the use of IRAP. IRAP or Interleukin-1 receptor antagonist protein is used in horses with degenerative joint disease (also commonly seen throughout the jockey club). IRAP is similar to PRP in that it is an autologous solution processed to increase concentrations of interleukin-1 antagonists. This aims to counteract the effect of interleukin-1, an inflammatory mediator. It is primarily used in cases of acute trauma. As I was only at the clinic for two weeks I was unable to follow up the effectiveness of these treatments long term, however I gained some insights from the vets on their effectiveness. 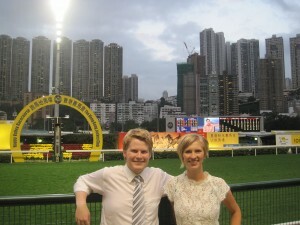 Our first race meeting was on Wednesday night at the Happy Valley race course located on Hong Kong Island. Happy Valley is one of the most spectacular sights in Hong Kong. A racecourse situated in the middle of downtown Hong Kong, it is bordered by massive stands on one side and a combination of skyscrapers and mountain peaks on the other. The atmosphere at Happy Valley was simply incredible. The stands were packed with local punters that passionately cheered and cried as each race finished along with a sizeable number of expats soaking in the night. As vet students we were given a look behind the scenes at how it all worked. Throughout the night we shifted between the different posts, looking at all the aspect of a Happy Valley vet’s job. One of the best opportunities was being given the chance to ride along with the ambulance and see the race from a different perspective. I was told that the ambulance job was similar to performing anaesthesia in that it’s 99 per cent boredom and one per cent sheer adrenaline. Fortunately (or unfortunately for a thrill-seeking vet student) there were no catastrophes that night on the track, so the ambulance rides were largely uneventful. The other vets at the track did their jobs at either the starting line or in the clinic within the Happy Valley Stables. The clinic work consisted of scoping horses that performed poorly, looking for bleeding or any other abnormalities. The next day’s activities consisted of the usual treatments in addition to post race check-ups on the horses that ran at Happy Valley. We were quite lucky in that the middle weekend of our placement coincided with the Chinese Lunar New Year Holidays. Unlike in Australia, New Years in China and Hong Kong is a days-long event with different celebrations held on each day. On Sunday evening thousands flocked to the streets to see the New Year parade held in downtown Kowloon. Colourful floats, stilt-walkers, dancers and all manner of other performers flocked to the streets to bring in the New Year. Even the Jockey Club was represented with a float. The Monday following New Year was a public holiday and saw the people of Hong pack the sides of the Harbour to view the night time fireworks. During this weekend we were also able to see some of the sights of Hong Kong, including the harbour ferry and various markets. On Tuesday we were treated to our second race meet of the placement, this time at the Sha Tin race course in the north of Hong Kong. The clinic itself, as well as all of the stables are all part of the Sha Tin complex. The New Year races were a spectacular sight to behold and saw a record crowd of nearly 120,000 in attendance, the highest in the past twenty years. In contrast to the races at Happy Valley, which had punters and revellers in equal number, the overwhelming majority of attendees at Sha Tin were there to place bets. For the local gamblers, owners and trainers it was seen as a sign of good fortune for the rest of the year to own or pick a winner on the first race of the Lunar New Year. This in part would have driven the record gambling turnover of Hong Kong $1.526 billion (nearly $200 million Australian). In comparison the 2012 Melbourne cup day netted gambling turnover of $147.2 million, with $97 million bet on the cup itself. Here we participated in similar activities to the race meet at Happy Valley. We would take turns seeing both the clinic where horses were scoped after each race and riding along in the ambulance behind each race. Like at Happy Valley the week prior there were no major problems or catastrophes, which left us with time to wander the stands and slowly wade our way through the crowds. The following Wednesday was also a public holiday, meaning the clinic was fairly quiet. We were however lucky to see an olecranon fracture repair surgery which kept us occupied for the morning. There we learnt about the different types of plates and screws used in such a repair, and the surgical techniques for their use. This also ended up being the only surgery we saw at the Jockey Club, but still a great opportunity to see some more specialised surgical techniques. On Thursday business resumed as usual and saw us getting back into the routine along with the other vets. Radiographs, joint injections, lameness exams and tendon ultrasonography were all seen in equal measure. By the end of our placement on Saturday we had gained a huge amount of experience in all of these areas, and in many other areas related to race track practice. Overall it was an experience I was lucky to have. Seeing the way a practice can work in a completely different setting was eye opening and I hope I’m lucky enough to have another experience like it someday. NEXT POST Next post: August issue closing soon!